Kyushindo karate is a relatively modern martial art, originating in the UK during the mid-20th century. Kyushindo karate takes influences from traditional Japanese styles of martial arts such as Shotokan and also includes some forms of Chinese-style arts such as Bagua. Kyushindo karate is not based on physical strength or bulk but on technique, footwork and economy of movement. As well as direct techniques, it also incorporates circular and flowing movements. 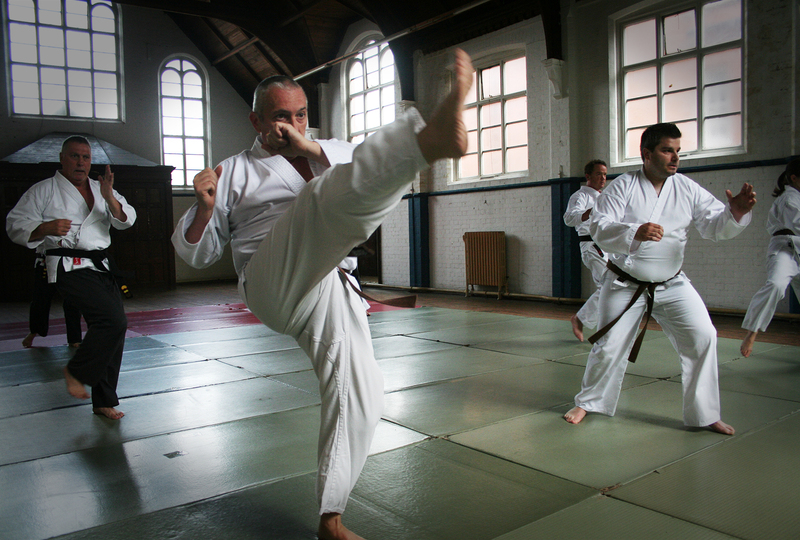 Kyushindo karate is taught by a team of fully qualified instructors. Our classes are suitable for adults and youths, including complete beginners who are taught in a welcoming and safe environment. The Highgate club is headquarters of the Kyushindo Martial Arts Association. Contact us for an introductory lesson. New members recieve a free karate suit. 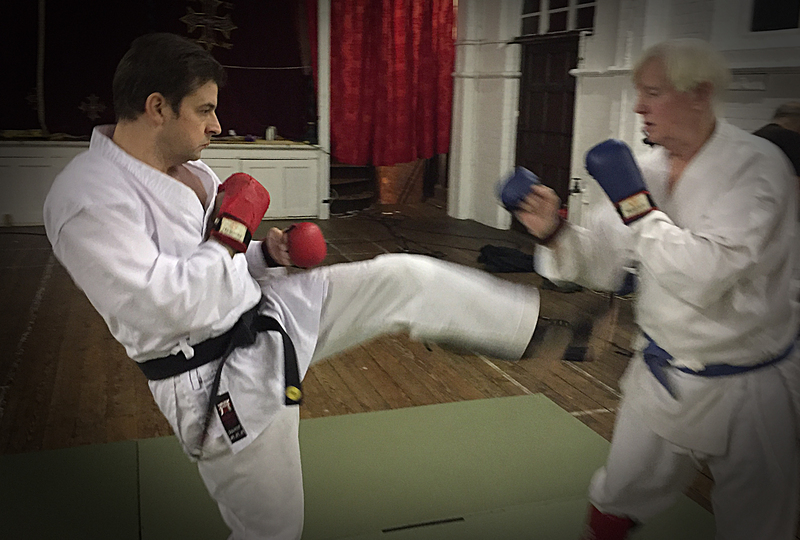 Do I need martial arts experience to train at Kyushindo Karate Highgate? No prior experience is necessary. Most members started training at Kyushindo Karate without any knowledge of martial arts. Our dedicated team of instructors tailor classes to the required levels of students. 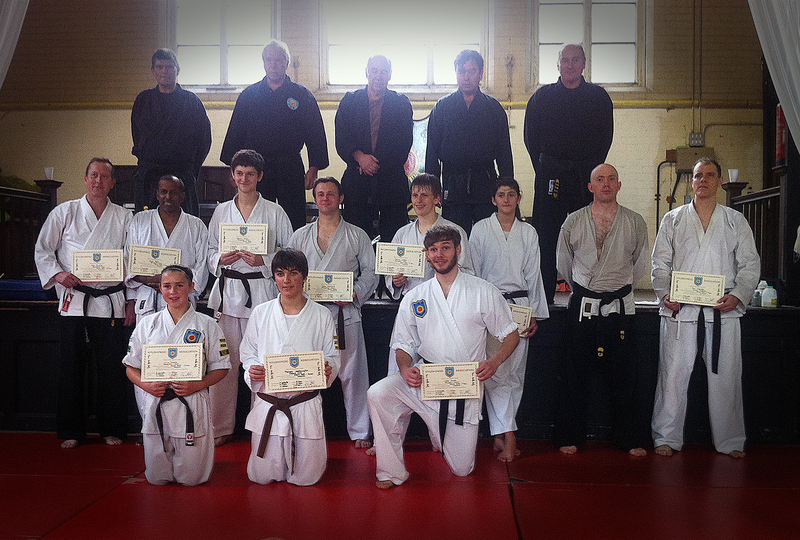 As students progress through the Kyushindo syllabus they undertake gradings and are awarded coloured belts. You don't need to be fit to start Kyushindo karate though members are required to be in good general health. Our classes will help you increase your flexibility, stamina and strength. What techniques are taught at Kyushindo Karate? 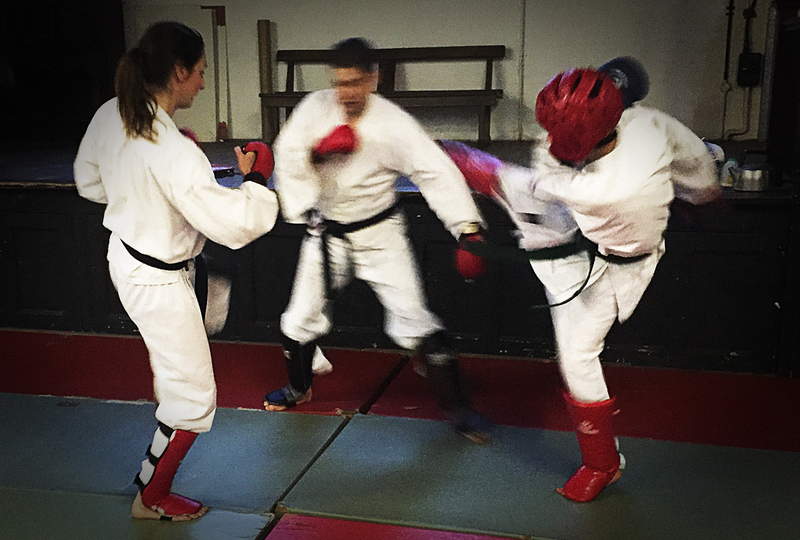 Students are taught a wide range of techniques that include punches, kicks, chops, blocks, elbows, knee strikes and various open and closed hand strikes. Training drills include the practice of techniques in different combinations. Striking pads and focus mitts are used to enhance training and to develop focus, range and power. 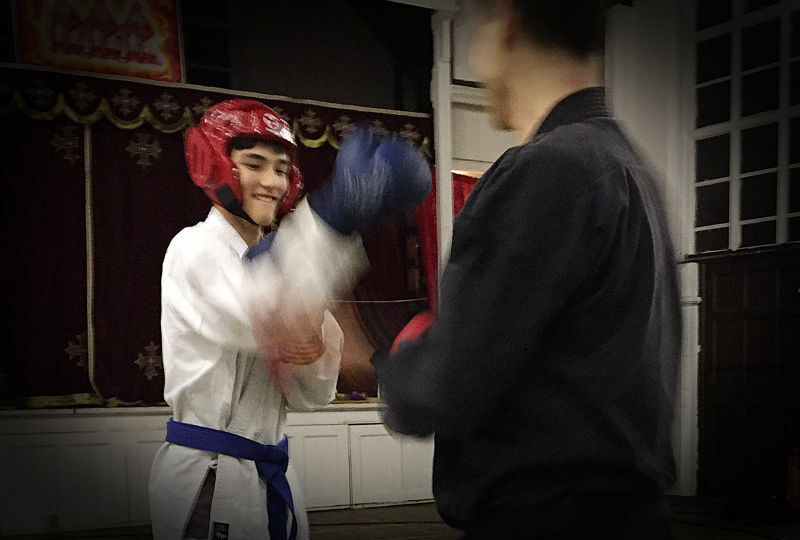 Students are taught sparring with and without gloves and pads. Kyushindo karate is mainly a stand-up martial art, though students are taught break falls, rolls and throws. Footwork and avoidance are integral to Kyushindo karate. 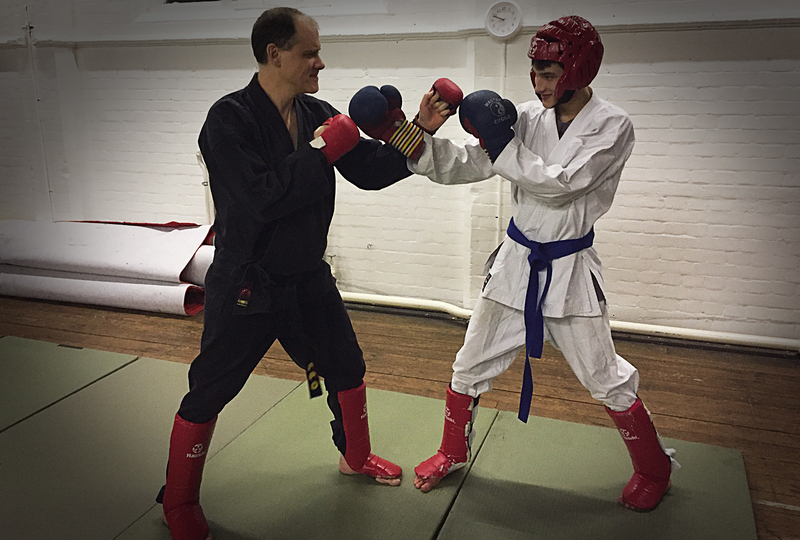 Lessons include the tuition of effective, practical advice and techniques to enable students to stay safe outside of the dojo (training hall). You can attend an introductory lesson prior to becoming a member. To attend regularly you will need to become a member. The £25 memberhip fee includes insurance. Do students take part in competitions? Kyushindo karate is taught as a martial art, not as a competitive sport. It is a practical style with a wide range of techniques, many of which can be applied in real-life situations where self-defence techniques might be required as a last resort. Do you hold classes for children? Not at moment, though youths from 10-years-old are welcome to attend classes. They will receive training suitable for their age. Can I turn up anytime? Please contact us by phone, email or complete our online form to arrange an introductory lesson. Loose fitting clothing such as a T-shirt and tracksuit bottoms are suitable for initial lessons. Upon joining, new members receive a free karate kit.